Through the process of our global perspectives lessons we were introduced to the staggering problem of textile waste. We first met the culprit in a group walk where we were asked to notice blatant mishaps and problems throughout the community. As a class we were able to identify the significant problem of litter in our streets. Once we observed and understood the magnitude of the bigger picture, we were able to delve deeper and locate a significant problem hidden from the lights of the mainstream media; textile waste. Textile waste is a material that is deemed unusable for its original purpose by the owner. Textile waste can include fashion and textile industry waste, created during fibre, textile and clothing production, and consumer waste, created during consumer use and disposal. At first glance, we were completely oblivious to the glaring issue however, upon further investigation we were at once taken aback by the substantial problem. Essentially, the striking problem of textile waste is woven together by two different complications; the wasteful process of creation and the vast amounts of fabric being wasted. The hidden process of the shirt you are wearing right now creates immense amounts of pollution. Firstly, the sheer amounts of greenhouse gases emitted is more than the aviation and shipping industries combined. To put that into perspective, if the aviation industry was considered a country, it would rank in the top 10 emitters, not taking into account the deleterious shipping industry. Additionally, the water pollution is unheard of with rivers in China changing colour due to the use of dye in clothes. Moreover, due to the blooming of such industries, organisations are not reluctant to expand with estimates believing that the fashion industry will in the future demand 35% more land and 50% more water. This obscene increase is due to the rapidly growing rise in consumption, with consumers taking in almost 62 million tonnes of clothes in 2015. Furthermore, estimates lead us to believe that this will almost double by 2030 with it increasing to approximately 102 million tonnes. This is significant to textile waste as with the amount of devastation this procedure creates major amounts are tossed away with no second thought, with more than 900,000 tonnes of fabric being thrown away in U.S alone, which is not the biggest manufacturer in the world. However, in an effort to combat this problem we have decided to begin recycling and re-using products in an environmentally friendly manner. We have been able to collect large amounts of unneeded fabric. And with this we split into groups and started little passion projects, such as making a flag, classroom cushions and reusable grocery bags, purely using the waste we have gathered. We do this with the aim of understanding and experiencing the incredible amounts of waste being created as you read this. In conclusion we as a class were able to learn about the concealed issue of textile waste and experience it in depth with our own eyes. Electromagnetism is undoubtedly one of the most intriguing and fascinating fields of physics. Though the two fields it consists of - electricity and magnetism - were at first thought of as completely separate and distinct realms of physics, during the 18th century, some physicists started believing that, in some way, these two were connected to each other, while others remained steady in their view that they were in no conceivable way related. While some had tried before him, the Danish physicist Hans Christian Oersted was the first one to actually prove that, in reality, electricity and magnetism were the “two faces of the same coin”. His discovery, which took place in 1819, was of immense importance for physics, because it gave an answer to one of its most fundamental questions. It was made through an experiment which took place in front of university students. Some say that it was completely incidental, while others believe that Oersted had tried it before on his own. Oersted discovered that, when electricity flowed through a wire connected to a battery, it influenced a magnetic needle nearby, moving it from its standard north-south direction, to a direction perpendicular to the wire. When the wire was disconnected from the battery, the needle returned to its original position. Oersted, seeing these results, came to the conclusion that the electricity flowing through the cable created a magnetic field around it, which influenced the magnetic needle, causing it to change its direction. Otherwise, a steady electric current produces a steady magnetic field. This discovery triggered a lot of research in the field of electromagnetism during the rest of the 18th and the 19th century. The direction of the current, however, plays a role in the direction of the magnetic field that is created. In image 2, we see that by changing the direction of the electric current, the direction of the magnetic field changes as well, causing the magnetic needle to rotate in the opposite direction. Since electricity is electrical charges moving in an oriented motion, Oersted had actually proved that charged particles, apart from creating an electric field, also generated around them a magnetic field. But did this relationship go the other way? Could a steady magnetic field produce a steady electric current? In 1831, another physicist, Michael Faraday, working on the fields of electricity and magnetism, tried to prove this last claim. Initially, he created a circuit consisting of a battery, a switch, and a solenoid. When he turned the switch on, electric current flowed through the wires, thus creating a magnetic field around it, according to Oersted’s experiment. Then, he wrapped the solenoid in a loop. However, whenever he created a current in his initial solenoid, a current was not created in the loop around it, as he would expect, since in the solenoid there would be a magnetic field. So, he realized that a steady magnetic field does not create a steady electric current. Nevertheless, he realized that a current was created in the loop whenever he opened or closed the switch of the circuit. Therefore, he came to the conclusion that a changing magnetic field creates an electrical current, not a steady one. In another version of his experiments on the same topic, Faraday used a magnet and a coil. He discovered that when moving a magnet inside an electromagnetic coil, then in the coil electricity started flowing. Therefore, a changing magnetic field generated electricity. This phenomenon is called electromagnetic induction. 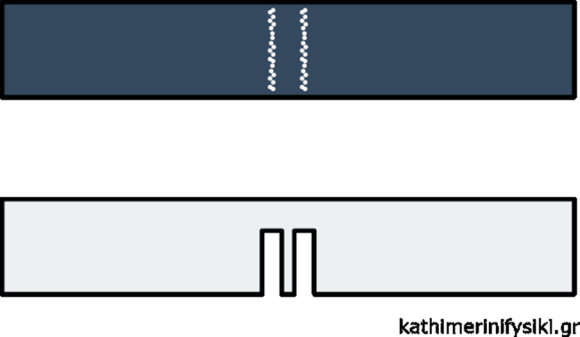 The same thing happens (current is created in the coil), when, instead of the magnet, the coil is the one moving, and the magnet is held stationary. The current produced by the relative motion of the coil or the magnet is called an induced current, and is said to be set up by an induced electromotive force. These discoveries may not individually seem that important, but they are fundamental factors that make our life what it is today. They are behind all electrical devices we use today, while also moving the economy. They are used in the way electricity is generated in power stations, where electric generators are used. These basically move copper coils inside magnetic fields, the opposite of what Faraday did in his experiment. There are two models we use today, for describing an atom’s structure: the Bohr model, and the quantum mechanical one. The Bohr atomic model, otherwise known as Bohr-Rutherford model, or cake model, was proposed by the Danish physicist Niels Bohr in 1913, as a description of the structure of atoms, and especially of the hydrogen atom. This description was radical, and differed from previous approaches, in the sense that it included quantum theory. In general, the Bohr model describes the atom as consisting of a positive charged nucleus, surrounded by electrons in defined circular orbits with discrete radii, a description which very much resembles our Solar System, with the nucleus playing the role of the sun, and the electrons the role of the planets . These orbits are symbolized by the capital letters K, L, M, N, O, P, Q, and each is labeled by a letter n, the quantum number, an integer ranging from 1 to 7. Electrons are placed in these orbits in a specific way, and each orbit can only hold a certain number of electrons, K taking up to 2, L up to 8, M up to 18, N up to 32, O up to 32, and P up to 18, and Q up to 8. Each orbit had to be filled, and then remaining electrons would be placed on a higher orbit. The energy of each orbit increases as we get farther and farther away from the nucleus. So electrons in farther orbits have more energy. The term we use for these orbits is energy levels, or otherwise shells, which aims to indicate this difference in the energy between two shells. The energy of an electron in any shell is what we call quantized, which means it can only take discrete values depending on its energy level, but can take no other value in-between the allowed ones of two energy levels. Electrons can “jump” between two orbits, between allowed, stationary states, but only by absorbing or emitting energy. The normal energy level of an electron, without it taking or releasing energy, is what we call a stable state, while moving to a higher, less stable orbit, is what we call an excited state. When the electron receives no more energy to allow it to remain in the excited state, it returns to its stable state, by releasing the extra energy. So, jumping to a higher orbit would require energy, while “immigrating” to a lower orbit would release energy. But in the second case, in what form would this remaining energy be released? Bohr suggested that the light emitted from hydrogen atoms, was the result of the transition of an electron from an orbit farther from the nucleus, to an orbit closer to the nucleus. This energy is released as a quantum of light, with the exact same energy the electron lost. For example, in this picture we see an electron moving from the orbit n=3 to n=2, therefore releasing energy. In hydrogen, an electron in an excited state in the orbit n=2, can fall back to its ground (stable) state, by releasing energy, as a photon of red light, in this case with a wavelength of 656 nm. With this model, Bohr was able to explain the spectral series, the regular patterns of discrete wavelengths of the light emitted by hydrogen atoms. However, this model does not predict the relative intensities of the spectral lines. The Bohr model, in general, is a simple model, which is very useful in understanding the fundamentals of how atoms work, and this is why it’s so widely taught. It, also, explains properties of heavy atoms, which had never been explored and explained before. It answers the question why atoms got smaller from left to right, on the same period of the periodic table, even though more protons and electrons are gradually added. It also explains the behavior of the noble gases, and also why atoms on the left side of the periodic table lose electrons, while those on the right gain. There are some problems with the Bohr atomic model, such as it not corresponding to the Heisenberg Uncertainty Principle, but it remains important and radical in its way of presenting the atoms’ structure. “Why is the sky blue?” It’s a question we all have asked when we were young, to which seldom we got a satisfying answer, apart from “Because it is”. Now, it’s time to really understand the scientific explanation of our ever unanswered question. Let’s start from the basics. As you probably know, the white light that comes from the sun is actually a combination of light of all frequencies, a mixture of light of different wavelengths. As the light travels through the atmosphere, it interacts with the particles of gas and dust existing there, “hitting” them. This is what the British scientist Lord Rayleigh found out, and is called Rayleigh scattering. Light of longer wavelengths, such as red light, scatters less while it travels through the atmosphere, while light of shorter wavelengths such as blue, scatters more. This is because red light, which is of a lower frequency (and thus of a longer wavelength), is able to pass through the particles and dust present in the atmosphere easily, without interacting, “hitting” them as much as blue light. Rayleigh found a formula to calculate this interaction, the scattering: I , meaning that the scattering’s intensity (I) is proportional to one over the light’s wavelength (λ), raised to the fourth power. So, light with a longer wavelength will make the denominator of this fraction larger, thus making the fraction itself smaller. Therefore large wavelengths have a small intensity of scattering. The opposite goes for shorter wavelengths of light. However, a rational question that might arise to one’s mind would be: “Since violet light has an even shorter wavelength than blue, then why isn’t the sky violet?” There are many reasons the sky doesn’t appear violet. Firstly, the sun emits more light with the frequency of the blue light, than light with the frequency of the violet light, therefore blue is more dominant. Secondly, the violet we refer to as violet is not really a purple-ish shade, but rather a deeper blue. There is no single frequency matching to pure purple. Purple light is a combination of other single-frequency light. We can understand this using this chromaticity diagram: The colors of the rainbow are the colors on the outer rim of the shape. Those within the whole internal area are created by combinations of the colors on either side of the shape. We can distinctly see that purple and all its hues are on the inside, created by combinations of red and blue. Lastly, our eyes are designed in a specific way to perceive light. There are cones within them, meaning color-sensitive cells, which are responsible for this function. There are red, green, and blue cones. 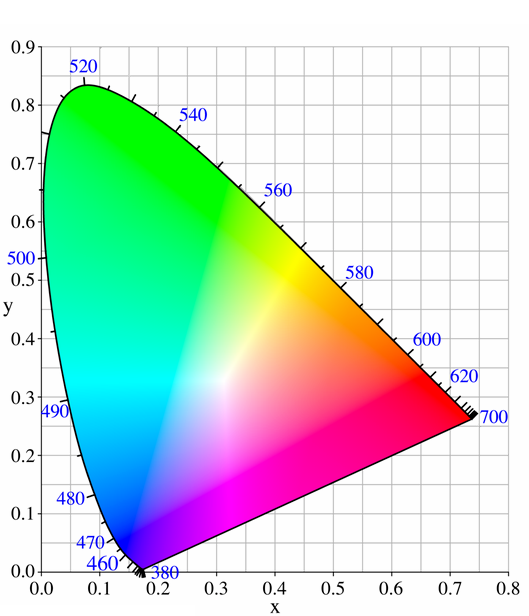 Each category of cones is mostly responsible for perceiving light of a specific color, but is also very slightly sensitive to other frequencies of light as well. Two kinds of cones, also, could have an overlapping range of the colors they are able to perceive. For example, green light could be detected mainly with the green cones, but also slightly with the blue cones as well. The blue cones, now, are mainly responsible for detecting blue light, and less for violet. So we are more sensitive to blue light, therefore the blue-violet part of the spectrum the blue cones detect, which is the one that dominates in the sky, after the scattering, is mostly perceived as blue. So now that we’ve understood why the sky appears blue during the day, we should go a bit forward. Why does it appear red during the sunset? This is mostly because during sunset, the sun has moved to such a position, where light rays have to travel more through the atmosphere to reach the earth. Therefore, blue light is scattered much more than when the sun is directly over the earth at noon, and thus takes much more time to reach our eyes, since it is “too busy” being scattered. Red light, which, as we said, scatters less, reaches us first. This is why the sky takes at sunset a reddish/orange hue. So, the blue light scatters much more, and takes more time to complete its journey, while lower-frequency light, such as red, can travel more easily, and reach our eyes first. Something else now, why do clouds seem white? Clouds are made up of water droplets, which are much larger than the molecules and dust in the atmosphere, and are large enough to scatter about all frequencies of light equally, as light enters through them. This kind of scattering is called Mie scattering. So, since all wavelengths are scattered, the light appears to be white, the combination of all wavelengths, making therefore the clouds seem white. If the clouds have a very large concentration of water droplets, or are in the shadow of other clouds, then light cannot pass easily through them, and they appear gray. It is worth mentioning here that mainly responsible for all these phenomena is the earth’s atmosphere. It is what, apart from all its other functions which support life, causes light to scatter, and makes the sky appear as it does. If we looked at the sky from the surface of the moon, however, we would not see it blue, but black. This is because the moon does not have an atmosphere to scatter the sunlight. All the mentioned factors have managed to create the beautiful sky we see from our position on the surface of the earth, and enjoy every day. It is truly amazing to see how science is able to answer questions ranging from simple everyday speculations, such as why the sky is blue, to serious scientific problems, regarding topics even such as black holes and quantum mechanics. But the charm to be able to explain everyday life is unique and irreplaceable. Storms, thunder and lightning are fairly common phenomena which oftentimes scare us, and are sometimes even responsible for natural disasters. However, they are also one of the most prominent and well known manifestations of what we know in physics as electricity. To understand such electrical phenomena, we should be able to understand the fundamentals of electricity. One basic notion is the one of electric charge. There are two kinds of charge: positive and negative. As it is widely known, like charges repel, while unlike attract. Charge is created when atoms receive or give away electrons. Atoms consist of a nucleus in their center, which is composed by protons and neutrons, the former being a quantum of positive charge, while the others, as their name indicates, are neutral and are not charged. Being a “quantum of positive charge” means they are the smallest quantity of positive charge there can be in nature. Around the nucleus orbit electrons, which are the quanta of negative charge, respectively. Atoms have the same number of protons and electrons, and are thus electrically neutral. When an atom loses or gains more electrons, it becomes charged positively or negatively, and is then called an ion. It is important to stress that electric charge is not created from nothing, nor destroyed. This principle is called conservation of charge. Another idea of electricity is the one of the electric current. The electric current, the flow of electricity, is the oriented motion of negative charges. The electrons are the ones creating the current, because it is they that can leave the atom. There are some materials which make the flow of the electric current easier, while others that hinder it. The first ones are known as good conductors of electricity, or simply conductors, while the others are known as insulators. The conductors contain many electrons that can be put into motion when given energy. Now let’s get into what happens during a thunderstorm and how lightnings are caused. When thunderous clouds accumulate, it is very probable that lightning will occur. These clouds are charged. Generally, the top part of the cloud has positive charges, while the bottom part has negative charges. It is not yet completely clear to scientists why this division happens. At the same time, because of a phenomenon called charging by induction, positive charges gather on the upper layer of the ground. This way, an electric field is created between the earth and the clouds. An electric field is a vector field created around a charge, which exerts a force to any other charge entering it. Lightning happens when the voltage between earth-clouds gets really high (10s of millions of volts). It may seem that lightning is directed from the clouds to the earth, but in reality, the charges move both ways, meaning both from the clouds to the earth, and from the earth to the clouds. The negative charges on the lower end of the clouds and the positive charges on the upper layer of the ground attract, and slowly some of the negative charges in the cloud start moving downwards, while some of the positive charges of the ground start moving upwards. These negative charges are called step leaders, while the positive ones are called streamers. 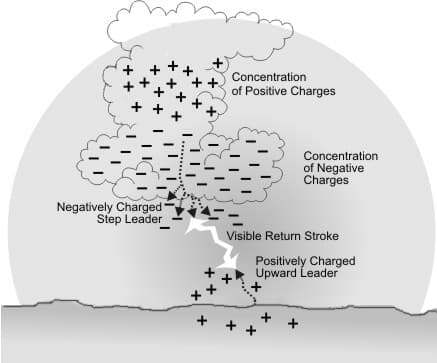 When the positive and negative charges connect, we see the lightning, and the negative charge of the specific cloud is “emptied” into the ground. During a lightning strike, the intensity of the electric currents reaches at about 50.000 Ampere. However, because of the very small time that it takes for the strike to happen, the energy released from the lightning is not enormous: it is about the same one as the one that a regular lamp would use up in one month. It’s very easy to calculate how far away a lightning has stricken, just by calculating the time it took the sound to reach us, after we saw the lightning itself. We know that there is a difference between the speed of sound and the speed of light, so it is expected to have this difference between the time we see the lightning bolt and the time we hear the thunder. Light travels with the fastest speed in the universe, 300.000 km/sec, while sound is slower, and travels with a speed of 343 m/sec, which means roughly 1 km in three seconds. Knowing this, it is easy to calculate the distance between us and the place the lightning hit, just by counting the seconds between the shine and the sound. But how is the sound of the thunder created? We know that sound is actually a wave with areas with higher and lower pressure in the air. When a lightning strikes, it rises the temperature around it to about 20.000 degrees Celsius. This extremely hot air creates a pressure wave which comes in contact with the colder air of the surroundings, and thus creates sound waves, which is what we know as thunder. All this brings us to lightning rods, or lightning conductors. It is obvious that lightning is very dangerous, and being struck by one could be proven fatal. This is why we take the necessary precautions. Lightning rods are considered as an invention of Benjamin Franklin. A lightning rod essentially is a long metal rod, around 2 cm in diameter, which aims to protect a certain structure. This rod is connected with a long wire that leads to a ground rod. It is crucial for the lightning rod to have a connection to the earth, in order to perform its protective action. The rods and the wire are made of conductive materials, such as copper, which would be able to conduct the lightning’s electricity, in case it should strike. If lighting was to hit the structure, it would most probably hit the rod, because the negative step leaders of the cloud would first find in their way the positive streamers of the rod to connect with. Here, it must become clear that, contrary to popular belief, the lightning rod does not attract lightning. It gives the lightning a safe option to pass through, if it were to hit the specific structure, providing a low-resistance path to the ground. If lightning struck a non-conductive material, it would cause it to burn or be electrocuted. Hitting the lightning rod, however, through its system consisting of conductive materials, it would be safely led to the ground, avoiding any possible damage. Finally, electricity is one of the most captivating fields of physics, and also one of the most essential factors that form our everyday life as it is. Electricity is everywhere, from the nervous impulses carried in our neural system, allowing us to sense and act, to every technological advance and invention. It is, undeniably, a fascinating field, which, however, may be encountered with dangerous forms, such as the one of lightning. It is, therefore, crucial to take the necessary protections against such life-threatening examples of electricity.